Eureka Springs Paranormal Weekend invites your to join us in another 3 Day Paranormal Event January 9, 10, 11 2015. The ESP event will again feature an expertly guided behind the scenes quest for evidence in the famed Crescent Hotel but will also include a one-of-a-kind investigation of its sister hotel, the 1905 Basin Park Hotel, which will be fully closed off and dark exclusively for event participants. This three-day, hands on investigation puts tools of the paranormal investigator in your hands as well as an introduction to ghost hunting , tour of the property on the ghost tour and unheard of 24 hour access to “active space” including rooms 218, 419, and THE MORGUE at America’s Most Haunted Hotel. Stayover Sunday for just $89 at the Crescent Hotel for the private investigation at the Basin Park Hotel. The Basin Park Hotel will be fully closed off and dark exclusively for event participants only. Call 877-342-9766 to Stayover Sunday at the Crescent. We have capped attendance (and reluctantly had to turn some folks away) to keep the group sizes down to reasonable proportions. And we have extended the hours of access to active areas to include the entire night. Late Friday and Saturday evenings, veteran Paranormal Investigator Larry Flaxman will guide small group investigations. When they conclude, the rest of the night is yours to independently investigate known active areas. And on Sunday night Larry will be conducting a guided investigation of the sister hotel to the Crescent, the historic Basin Park – which will be closed and entirely empty for the occasion! Ghost tours, a ghost play, Ozark tales of ghosts and the supernatural, personal ESP evaluation and the ever-popular Psychomanteum (this year constructed at the highest point in the Ozarks – the notorious Norman Baker’s penthouse suite, 502), van tours of Eureka Springs – all this and plenty of opportunities to meet and mingle with others of similar interests to your own – plus T-shirts! 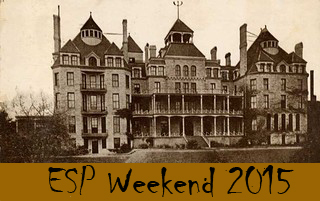 ESP weekend – a Eureka Springs tradition. Christmastime at this Historic Hotel of America has become one of The Ozarks region’s most popular winter holiday traditions. Christmas Eve-The 1886 Steakhouse will be open for dinner service from 5:30pm-9pm.View Menu. Christmas Day-Breakfast will be served from 8am-10am. Sky Bar Gourmet Pizzeria will be open Christmas Day serving regular menu from 6pm-8pm. View Menu. Part of that tradition is the Christmas at the Crescent Week. 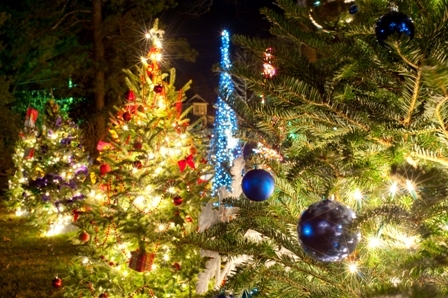 One such community-wide event is the Lighting of the Christmas Forest on Saturday, December 6 at 6 p.m. More than 30 trees will adorn the holiday focal point of the hotel’s nearly 15 acres, The East Lawn. Each tree will be uniquely decorated one to the other since each tree represents a different local and area charity. “Not only is our Christmas Forest a sparkling sight to behold, visitors to the forest can ‘vote’ for their favorite tree. At the end of the ‘election’ on December 31, each tree’s ‘votes’ will be donated to that charity. Additionally, the top three vote-getters also receive a nice cash prize donated from the hotel,” explained Moyer. Santa arrives at the hotel on Sunday, December 7 when he is the star attraction at Santa’s Brunch. The two elements that guests are suggested to bring to this feast of holiday culinary delights are a large appetite and a camera. While eating to their hearts’ delight guests also getting a chance to sit on Ol’ Saint Nick’s lap for a chance to capture a photographic lifetime memory. Santa has been known to balance an entire family on his red velvet knees for that just right shot. Brunch is served from 9:30 a.m. to 2 p.m. while Santa will be poised for photo ops from 11 a.m. to 1 p.m.
Each weekday, the hotel’s activity department creates a festive to do, while at noon during this special holiday week, the hotel’s Crystal Ballroom swings open its doors for hungry patrons and school groups ready to perform for those enjoying a mid-day repast. Bands and choirs from local area middle and high schools present medleys of festive tunes that always bring back happy holiday memories from years gone by. For those holiday travelers who long to return to the 19th century and the days of Charles Dickens, the Eureka Springs Readers Theater troupe presents a rousing adaptation of “A Christmas Carol” following a Dickensian-themed feast. This “Holiday Feast with Charles Dickens” is a Tuesday night affair, held December 9th in the hotel’s Crystal Ballroom. Reservations are recommended since seating is limited. Dinner is served at 6 p.m. followed by the performance. 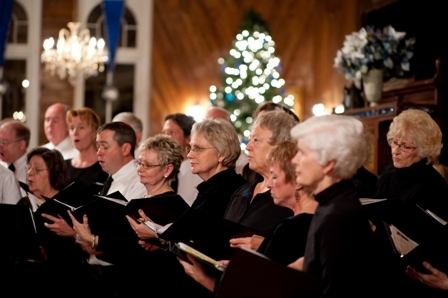 Thursday night, December 11th will utilize that same hotel venue but this time it will be filled with the polished holiday musical stylings of The Ozarks Chorale, a popular vocal ensemble that has performed in New York City’s prestigious Carnegie Hall. A dinnertime concert entitled “Sounds of the Season” is planned at 6:30 p.m. as the executive chef offers up its special “Tastes of The Holidays” menu accompanied by one of the largest wine cellars in the state. Reservations are not required. 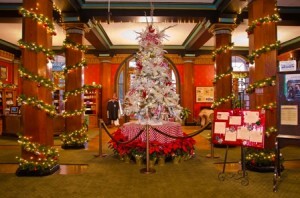 Christmas at the Crescent concludes with the Spring Street stroll down Eureka Springs’ Promenade from the Crescent Hotel to Crescent Spring and an event ONLY to beheld in 2014 as the Crescent celebrates a “Spirited Wedding Celebration” in the Christmas forest on 12-13-14. “One great outcropping from our hotel’s annual event has been the evolution of the community pulling together to expand Christmas lighting throughout the town as well as make this week and the days surrounding it a true Christmas festival,” added Moyer. weeklong schedule of activities for visitors, residents and guests which is called “Christmas at the Crescent”. This year’s yuletide celebration at this mountaintop spa resort runs from December 6 through December 14 here at 75 Prospect Avenue on the Historic Loop. It is all part of the full, nearly month-long calendar of seasonal events planned here at one of America’s Dozen Distinctive Destinations. For more information on “Christmas at The Crescent”, one should go to ChristmasattheCrescent.com. 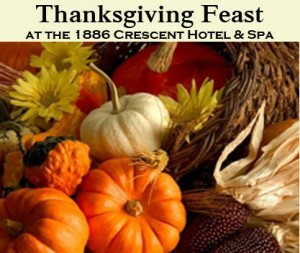 Join Us this Thanksgiving at the Historic 1886 Crescent Hotel & Spa. Anyone staying over on Wednesday, November 26th will be able to use their 2 Breakfast Vouchers for Thanksgiving Breakfast OR use their 2 vouchers for the Thanksgiving Feast (good for one person) from 11am-4pm. SkyBar menu served all day. We will also feature a Thanksgiving special plus Chef Lee’s Couch Potato Creations.